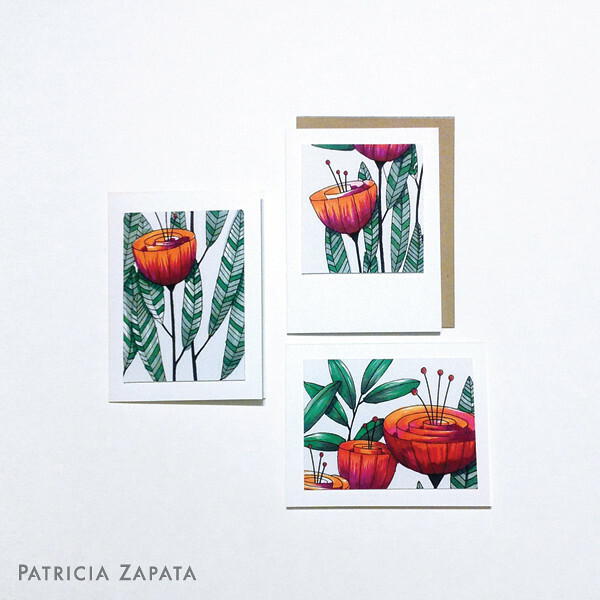 A Little Hut - Patricia Zapata: happy national coloring book day! Tomorrow is National Coloring Book Day. Who knew? I just found out by chance a couple of days ago. I celebrated a day ahead by coloring one of my Flower Nook coloring pages and then turning it into a trio of note cards. This weekend also marks the end of our vacation (insert sad face). We stayed home this year and I took a very close to 100% internet and work sabbatical. It was a fabulously relaxing week and now I feel energized to take on the end of the summer and the start of school in a couple of weeks (ahh! too soon!). I'd been wracking my brain to see how one the illustrations from Flower Nook could translate into a paper craft project and I just couldn't come up with anything. I want it to be a bit like what I did with the Fantasy Bloom Gift Set. The week off gave me the mental space to finally come up with an idea that I think will work. We'll see! To celebrate National Coloring Book Day I'd like to give away 2 signed coloring books (and a few other suprise goodies) today! All you need to do is leave a comment below (include your email address or a way to contact you) by answering one little question: what do you like the most about coloring and what is your favorite coloring tool.. or just say hello! I'll pick a random winner from the comments that are posted from now until Monday (August 3rd). That's it. Good luck, happy Sunday and happy coloring! Beautiful images Patricia. Thank you for the chance to win one of your amazing books. The thing I love about colouring is:- when I find a line image I like I can start to create something original and at the same time become completely absorbed in what I am creating. Every other thought escapes from my head and when I am done I am completely relaxed and chilled. Watercolour pencils are my favourite medium to use, although some images cry out for stronger colour and then I use my spectrum joins or promarkers. I love coloring. I haven't stopped doing it since I was a kid. Always kept on coloring. In children's coloring books. Then I went to stamped images. And now with the plethora if adult coloring books coming out, I transitioned to 'real' coloring. So relaxing and rewarding to be able to color these! I just spent Friday evening, staying up too late, coloring with a good friend! That to me is the best, even if I just end up doodling nonsense while we chat. It is a great way to unwind. The best thing about coloring is the color. I have always loved to color! Right now I use mostly colored pencils. Thanks for the chance to win! Your coloring book is an inspiration. Wether you color inside the lines or out, coloring releases the inner child in you. I love coloring because it soothes and calms me. The repetitive nature of applying color to the page, choosing the colors that I love best, is very relaxing and puts me in my "happy zone." 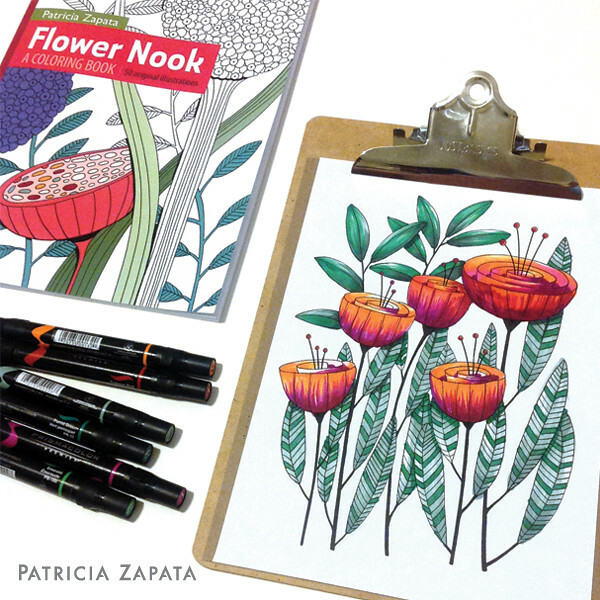 Your coloring book is lovely, Patricia! Congratulations on its publication (and thank you for offering this giveaway)! So lovely!! I love colouring because it makes me happy. I blend and blend and choose colours. Congratulations!! Hi Patricia :D Happy National Coloring book day! I love coloring because it relaxes me and yet puts me in an creative frame of mind. I love that it's portable too...you can do it pretty much anywhere! As for favorite coloring tool, that all varies, I love my chameleon markers, I love my lovely pencil crayons and if the paper is right I adore watercoloring as well :D and when I'm coloring with my girl in her books...I still adore an old fashioned Crayola crayon as well! It's my belief that everyone should color! Coloring allows me to explore color combinations in a fun wayI didn't know you had a coloring book! Can't wait to see it! I think that everyone loves coloring but many are afraid to admit it! A few months ago, I brought in to work, 2 huge boxes of crayons and printed out some pretty coloring pages. They looked at me like.....'what are you doing?' They think I am a little nuts! The crayons and pages are still there and not much has been done on them, it doesn't matter though. To me, coloring is a great way to relieve stress and if there are slow days at work, coloring can fill those otherwise boring days. For me coloring is so relaxing and meditative. My favorite way to color is with either Copics or watercolors. Coloring for me is relaxing. Love the idea of adult coloring books, yours is beautiful. For all the reasons people like to Zentangle, I love to colour. Colouring sharpens ones focus, encourages a state of well being (Zen) and satisfies a creative itch. I will colour with anything I can get my hands on(not that I am proficient with all methods...but it doesn't matter still applying colour) If I had to choose, Tombows are my favourite but then again I love PanPastels... I just love Colour. I love to relax with coloring. I've been coloring in adult coloring books for many years now and I have passed this love onto my family members. My favorite tool to use is Inkssentials. They blend so lovely and the color are intense! Thank you so very much for a chance to win. Your art is absolutely beautiful. It always makes me smile! Happy National Coloring Day! Coloring is timeless fun. You can be 5 or 55. It gives everyone a chance to create and leave the sheet better than when they found it. Thanks for the chance to win one of your awesome Flower Nook Books. I just found out about the National Coloring Day! I am recently into coloring using color pencils, watercolor paint, Watercolor pencils, dye inkpads, chalk edgers, and markers. Those are my favorite tools. And I wanna learn to do coloring with acrylic paints and gelatos. As a kid, I never loved coloring because I couldn't get it neat enough. But, as an adult, I love playing with different colors in a design. I think my favorite thing to color with is still crayons (plus I love the smell of a fresh box of Crayolas!). But, I also like using colored pencils and Sharpies. Si beautiful. Love colouring books since always! Bello! This is such a great idea. Who doesn't like to color ! Now it's a legitimate adult thing also !! Your books looks very beautiful. Thanks for the notice and thanks for the opportunity to win this book. I'll have my pens, markers, and inks ready to go ! 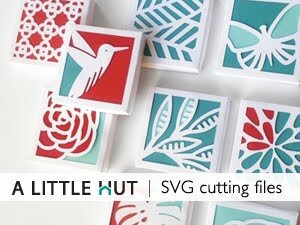 This is a creative crafters dream ! I love to color using colored pencils. When I was a kid I always pushed too hard with my crayons because I wanted my colors to be bold. I buy my daughters "adult" coloring books because the illustrations are better and they allow more room for creativity. Thank you for the opportunity to win one of your beautiful books! Coloring is very relaxing. I love good colored pencils to work with. I find coloring very soothing, and I like to use colored pencils. As an elementary teacher for many years I've watched the art of coloring go out of fashion (except for coloring maps) and I think that's too bad. Last fall when I was teaching for someone on maternity leave I mentioned this to the teacher across the hall. She told me that in her earlier school when the kids got a little squirrely she'd have them begin coloring. She referred to this time as SUAC (Shut up and color!) Only the teachers used that term, however. So, when my wife recently told me about her desire to do some adult coloring I told her about SUAC. Your Flower Nook would be the perfect vehicle for her own private SUAC. I plan to surprise her with some coloring books and a nice set of colored pencils for her birthday in mid-September. I love to borrow my daughter's colored pencils and spend some time coloring, perhaps with a nice cup of coffee. It's a perfect "me" time! Coloring is something I love doing with my granddaughter when she spends time with. She is all about color. For me, coloring is very relaxing and a stress reliever. When I was stationed in Iraq, I had my family send me coloring books and crayons. Helped a lot at the end of the day to just sit and color and listen to music. I'm an Art teacher and think this trend is delightful! Your graphics are beautiful! I love coloring because it is so relaxing, and it's a way to make something my own. Love your illustrations, so clean and deceiptively simple. Thanks for the give away! For me it is easier coloring with pencils but I think it is more nuanced do with watercolors. I'd love to get more notebooks and practice with them. Good luck and thanks for the draw Patricia, the book is gorgeous !!! I love colouring with watercolours - your images are beautiful! I wish I could have colored on the 2nd, but I'm still under the weather...boo hoo. but I will recover and play with colors in your Flower Nook a coloring Book!! Oh I love to color in a coloring book. I usually spend some time coloring with my kids - sharpies with my 10 yo or crayons with my 4 yo. Its a great way to unwind and hear about their day too! I love coloring just about anything...coloring books, designs that I have stamped, pictures I have found online and printed out. I think my favorite method of coloring is pencils, but having started using the Zig Clean Color pens, I could see those taking over as my favorite very easily! To do coloring into a magical picture is marvelous! I find pencils are the best and one can blend the colors oh so delightfully. Thanks for the opportunity of your new color book, and it looks to be great fun! I love your graphics, so happy when I heard of the new colouring books. Such a great meditation to sit and colour. I like pencils but have become a bit of a Copic convert lately. Best of luck with your new endeavour.